I started with my iPhone 4 footage and managed to get a solid 0.7159 solve error (using the phone preset w/k1+k2+focal length) with just 21 markers (including my new Favorite Thing, perspective markers). Huzzah! Except when I Setup Tracking Scene - the presented solution shows the camera and the markers in an almost completely straight line, or has the camera stretched out to a ridiculous distance, covering the markers (which are in an almost completely straight line). I've set the floor, the origin, the x axis, the scale - all to only minor adjustments. How can I convince Blender that it's looking at a fairly broad street, not a tiny, thin path? The problem is displayed in your screenshot. First off the iPhone 4 has a 3.85mm focal length (part of the iPhone 4 preset), no were near 457. Because you had a focal length that was way off, it messed up blender big time. 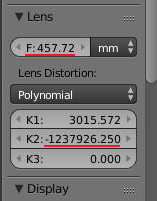 No doubt you had Refine in the Solve settings set to adjust the K1 and K2 values. -1237926.25 is a HUGE number, way bigger then anything you will ever really need; for that matter the K1 value is way too high. The focal length and Lens Distortion values are the cause of your problem. Not the answer you're looking for? Browse other questions tagged camera video tracking or ask your own question. why is my object solve not matching my plane track? Why does the solve error keep changing? 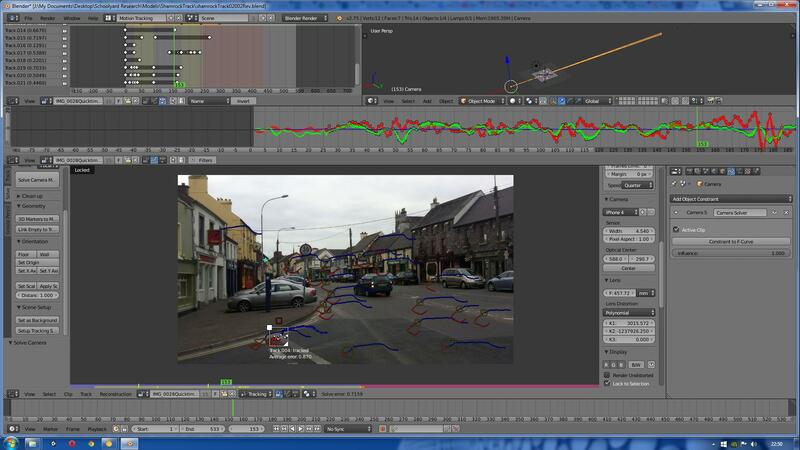 Motion Tracking. Why is my solve error so high? How does real life camera sensor size affect tracking on Blender?